Ward Ulmer, PhD, is interim president of Walden University, responsible for the strategic direction and vision of the university and the overall day-to-day management, academic quality, financial performance, accreditation, and governance. He brings nearly 20 years of higher education leadership to the role, including more than 5 at Walden, where he most recently served as chief learning officer and vice president of College Administration. He also served as associate dean in the College of Management and Technology (CMT) and vice president of The Richard W. Riley College of Education and Leadership and CMT. 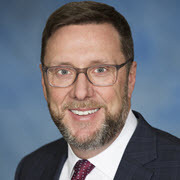 Prior to joining Walden, Dr. Ulmer held leadership positions in education and business, including serving as chief academic officer and chief information officer for Latimer Education and senior vice provost for Strayer University. He also volunteers his time serving on the Accrediting Commission of Career Schools and Colleges (ACCSC) team that evaluates accreditation standards for higher education institutions. Throughout his career, he has championed access to higher education, working with historically black colleges and universities, technical colleges, and institutions that focus on working professionals. A first-generation college graduate, Dr. Ulmer has a BSc in Business Administration from Charleston Southern University and an MA in Computer Resources and Information Management from Webster University. He earned two PhDs as a working professional, a PhD in Higher Education Leadership from Clemson University and a PhD in Applied Management and Decision Sciences from Walden University. Dr. Ulmer is married and has four children. Ulmer, W. E., Means, D. R., Cawthon, T. W., Kristensen, S. A. (2015). Investigation of remedial education course scores as a predictor of introduction-level course performances: A case analysis at one for-profit institution. Journal of College Student Retention: Research, Theory & Practice. Ulmer, W. E. (2014). Why online education helps in the global marketplace. Gulf Business. Ulmer, W. E. (2014). How do you measure success? . The European Executive Education Review. Ulmer, W. E. (2007). Windows Network Administration Project Manual. Ulmer, W. E. (2007). Perceptions of Higher Education Faculty Members on the Value of Distance Education. Quarterly Review of Distance Education.